EZ Cam XRs are designed for non-slotted struts. They allow both positive and negative camber changes up to approximately 1.75° (depending on vehicle) by replacing the upper O.E. 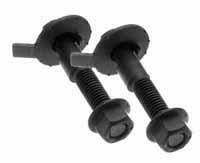 strut/spindle bolt. This easy to use adjuster provides built-in adjustment over the life of a vehicle just by rotating the head of the bolt. Each EZ Cams each kit contains TWO pieces.